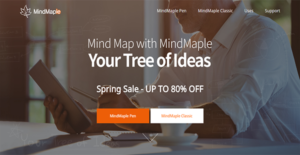 MindMaple is a sophisticated and intuitive mind mapping software that you can use to organize information and ideas. It can help you with managing tasks and projects, brainstorming for concepts with your teammates, and more. MindMaple is a flexible software that lets you add and reorganize topics as well as subtopics as if you are mapping your thoughts in a notebook. The software supports your creativity with its adaptability and enables you to play around with your maps’ structures. Moreover, MindMaple is a customizable application. You can personalize it to reflect your preferred colors, add visually engaging elements to it like images and pictures, and explain things succinctly and interactively with videos. MindMaple supports creativity. That is why the software provides you with the flexibility you need to play around with ideas through its natural drawing interface. This means that you can move things around and personalize your maps and spaces to your heart’s content without restrictions. MindMaple is not an all text mind mapping application. It also gives you tools for you to add images, pictures, and videos to your maps. On top of that, you can also tailor the themes and colors of the interface to suit your personal preferences or your organization’s branding. With MindMaple, you can do more than curate information and develop ideas. You can also use the software for managing project tasks as you can integrate important details about your responsibilities to your maps. You can even attach documents and other content to help you complete your assignment. Sometimes, you may need additional tools to help you add more particulars to your maps. To help you do that, MindMaple has relationship builders and boundary makers for you to draw associations between topics and subtopics. On top of that, the application gives you the ability to paste hyperlinks in your maps for you to access web content easily. If you want to share your maps with colleagues who have no access to MindMaple, you can export information into text, HTML, image, and Microsoft applications formats. This wide variety of options allow you to export your maps in the most convenient way for you and your teammates. If you are considering MindMaple it might also be sensible to examine other subcategories of Best Mind Mapping Software gathered in our database of B2B software reviews. Since each organization has particular business requirements, it is sensible for them to abstain from seeking a one-size-fits-all ideal software solution. Needless to say, it would be useless to try to find such a platform even among widely used software applications. The clever thing to do would be to jot down the various vital aspects that need consideration such as main features, budget, skill levels of employees, company size etc. Then, you should do your groundwork thoroughly. Read some MindMaple reviews and check out each of the other solutions in your shortlist in detail. Such exhaustive research can ensure you weed out ill-fitting applications and choose the system that provides all the aspects you require for business success. How Much Does MindMaple Cost? MindMaple has four enterprise pricing options. They are listed below to help you decide which one is the most suitable for your needs. MindMaple is also working on dedicated apps for the iPhone and iPad. For updates regarding iOS development, visit the website. We realize that when you make a decision to buy Mind Mapping Software it’s important not only to see how experts evaluate it in their reviews, but also to find out if the real people and companies that buy it are actually satisfied with the product. That’s why we’ve created our behavior-based Customer Satisfaction Algorithm™ that gathers customer reviews, comments and MindMaple reviews across a wide range of social media sites. The data is then presented in an easy to digest form showing how many people had positive and negative experience with MindMaple. With that information at hand you should be equipped to make an informed buying decision that you won’t regret. What are MindMaple pricing details? What integrations are available for MindMaple? If you need more information about MindMaple or you simply have a question let us know what you need and we’ll forward your request directly to the vendor.